It is hard to understand how “joy; noise, etc” can coexist with “life” and “dream.” That is why some researchers suggested that we are dealing with two different words, one for “dream” and one for “noise,” each with its own etymology. “Life” has somehow fallen by the wayside. Modern dictionaries also often refer to two different old words. I would like to begin with what looks like the most logical conclusion. Since speakers of Old Saxon found the coexistence of such outwardly incompatible senses as “life; existence” (on earth and in heaven) and “dream” (“a vision in sleep”) natural, we seem to be dealing with one word and have to look for one etymology of Old Germanic draum– (and try to understand where “noise” comes in). Of course, I am not the first to think so, and of course, the main evidence for this conclusion has always been the usage in Heliand. It will be remembered that the oldest consecutive text in a Germanic language is the fourth-century Gothic Bible. Only parts of the New Testament are extant, but, unfortunately, the early chapters from Matthew have not come down to us, so that we do not know what the Gothic word for “dream” was. If it had survived, all our questions would either have been moot or, conversely, even harder to answer. Given the information at our disposal, modern historical linguists have to combine the senses “life,” “dream,” and “noise (din, music)” in one word. Obviously, we should not toy with the suggestion that two or more thousand years ago, people cherished the ideas of symbolist poets and depicted life as a dream. After the conversion to Christianity, even life in heaven appeared as a solid part of reality. Another important consideration is this: ever since the emergence of Freudian theories, dreams have been treated as clues to individuals’ subconsciouses and past experiences (often suppressed in later life). To ancient and medieval speakers, dreams were a guide to the future. Time and again, we read about prophetic dreams, and dreams were told only to come true. They were part of reality, not of the fantasy world. A dream band. 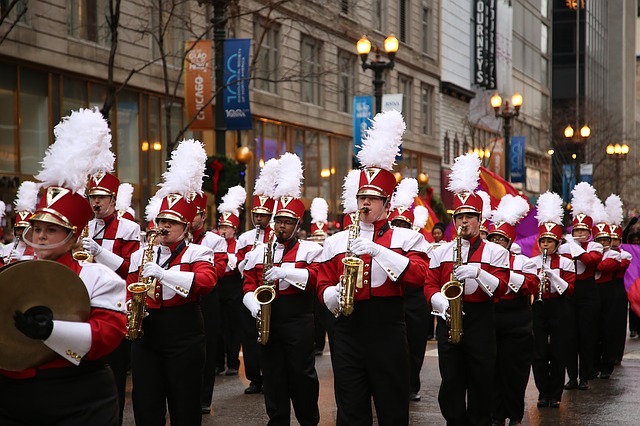 Image credit: Chicago Marching Band by sam99929. Pixabay License via Pixabay. The least predictable sense of Old Saxon drōm is, strangely enough, certain. We know it, because the style of Heliand has an important peculiarity. The narrative in it is based on the endless variation of synonyms. For example, we can read something like the following: “and numerous were brave heroes, / valiant warriors.” The reinforcing phrase always means the same as the main one. In the parable of the narrow gate, righteous people are promised līf ēwig [life eternal], /diurlīcan [glorious] drōm.” Thus, drōm meant the same as līf, and the meaning of līf poses no problems. The first to contest the idea of two homonyms was the distinguished German scholar Franz Rolf Schröder, who, as early as 1924, suggested that the unifying sense of all the occurrences of drōm was “ecstasy.” I will skip the details and the references (if someone is interested, I’ll be happy to supply them). Schröder’s short contribution was not missed but, in principle, ignored. Indeed, “ecstasy” does not seem to be a fully convincing clue to dream as life, as a vision in sleep, and as noise. Below, I’ll offer my own semantic reconstruction of draum- (for what it is worth, as they say). I believe that the mental picture of the human world, as it has come down to us from Old Germanic, included two images: of life experienced in our waking state (in Old Saxon, it was called līf; originally, the noun for “life” denoted “body”) and of life experienced in sleep, when everything is intangible and incorporeal. Life in the light of day was apparently associated with vision. By contrast (and this is the least secure part of my hypothesis), life experienced in sleep was described as heard rather than seen. Perhaps Schröder had a point after all: sleep, ecstasy, and noise are easy to imagine as related. Or perhaps nightmares were treated as screeching demons (mare in night-mare and alp– in German Alp-traum were supernatural creatures: alp– is related to elf). Or perhaps “noise” meant “disturbance” rather than “din,” and sleepers believed that they were deafened by those demons (hence the reference to the “roar” they made). If this reconstruction has merit, draum– originally denoted 1) “life experienced in sleep,” 2) “a vision during sleep,” and 3) “(deafening) clamor.” In Old Saxon, the first meaning was broadened, so that “life experienced in sleep” yielded the sense “life (in general),” and drōm became a synonym of līf. The second and the third meanings did not undergo any changes. In Old English, only “noise” survived and acquired many contextual overtones, as it were (“merry noise,” “music,” etc.). Old Icelandic and Old High German retained only the sense “a vision during sleep.” Words broaden and narrow their meaning all the time, so that the processes described above are trivial. As pointed out last week, Engl. dream surfaced with its present-day signification only in the Middle period, most likely, under the influence of Scandinavian (some linguists doubt this idea, but it seems the best there is). The ultimate draugr. 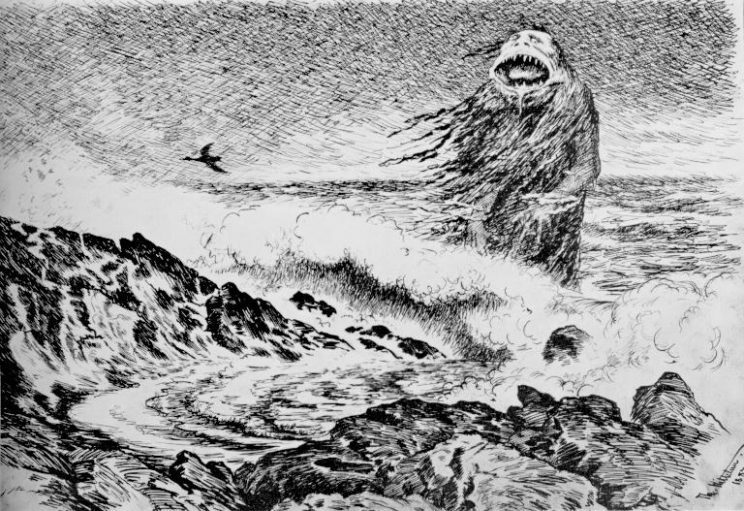 Image credit: The Sea Troll by Theodor Kittelsen. Public Domain via Wikimedia Commons. 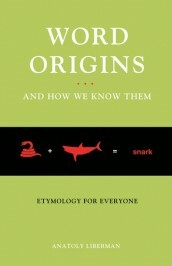 Etymology provides insufficient help in our case. According to one suggestion, draum– is related to Classical Greek thréomai, “I shriek.” This meaning seems to have been made to order to support my hypothesis. But the root of thréomai (and its several Greek cognates, such as thrýlos “noise, din” and throûs ~ throós “shouting”) goes back to draugma-, and the presence of g in the Germanic root draum– (from draugm-?) is questionable, though not improbable. The root with g occurs in the German word for “deception” (Trug) and the Icelandic word for “ghost” (draugr). Yet nightly visions do not seem to have been identified with deception (as mentioned above, the opposite is true), even though ghosts perverting reason and confusing people go well with the demons mentioned above. Other etymologies of the Germanic noun presuppose so much phonetic legerdemain that they can hardly be taken seriously. If draum did have g in the root, the putative Greek congeners lend credence to the idea of draum– as the name of a world of deafening noise. In Germanic, this world seems to have been associated with (disturbed, unquiet) sleep. Our story has several elements that compensate for the uncertainty of the final conclusion: demons on all sides, deafening noise merging with merry music, life on two planes (one for seeing, the other for hearing), and an evasive consonant, with all that being combined in a dream. So I ask you: Are there many areas in the humanities more absorbing than historical semantics? Featured image: “How wonderful is sleep….” (P. B. Shelley, Queen Mab, line 1). Children sleeping by Annie Spratt. Public Domain via Unsplash. Like the idea of “ecstacy” or any feeling outside ordinary daily living. such as dreams, merriment, noise, drinking or eating mind-altering drugs.